Why the BLACK In My Internet World?? I just wrote an email to my staff about what's going on in the internet world today and I thought I would share this through my blog as well, because the implications affect all of us and how we use the internet. Just sharing some answers here before the questions come up today. Q: Okay, I went to Google this morning (Wed) and the logo is all blacked out. What gives? Q: So, My kids were researching some information today (Wed) and Wikipedia is gone!? AHHHH! Today (Wed), is a day where larger companies and organizations on the web are "blacking" out some or parts of their sites as a way of speaking out against some legislature known as SOPA (Stop Online Piracy Act) and PIPA (Protect Intellectual Property Act) that are currently before Congress. The Senate will begin voting on these bills next week (Jan 24). Personal thoughts: You might be thinking, "but piracy is bad, right? Why wouldn't you want to stop online piracy?" The reason many are opposed to this is because while these bills are being touted as focusing "online piracy" the implications for this would give the government control over the internet and take away the sense of freedoms on the internet where we can create our own content, start our own businesses, and really have the internet be a wide open frontier. If the gov't starts to regulate the internet, they would get to have a say in what websites you can go to, how online businesses can be run, and really clamp down on what we can and can't do. The whole purpose of the "world wide web" is that it's open to all to explore, create, communicate, and collaborate. I personally don't want to see the government have any kind of regulation over the internet because I think there are many at the top that don't have a sense of what the fundamental foundations of the internet are supposed to be. More answers and facts HERE along with a 2min video that really shares the thoughts behind this movement. Great info graphic HERE with a lot of details & an online petition if you want to speak out against these bills. 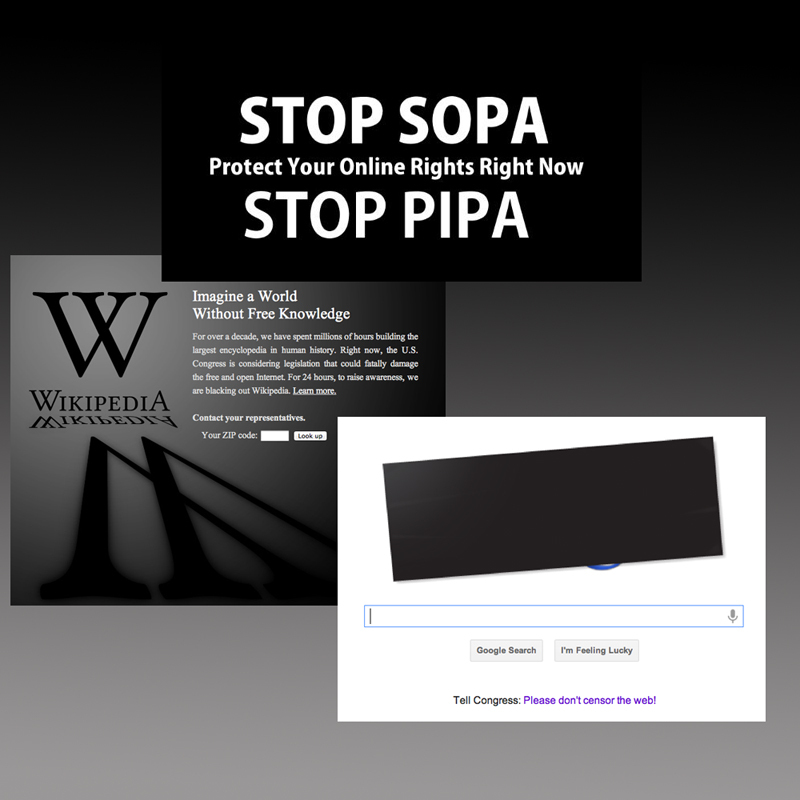 OR -- use the freedom you have on the web and do a search on "stop SOPA" or "stop PIPA" and see what you find! Just wanted to educate all on what was happening around us today in case you hear about it on the radio or see it on the news so you have a little more background information.